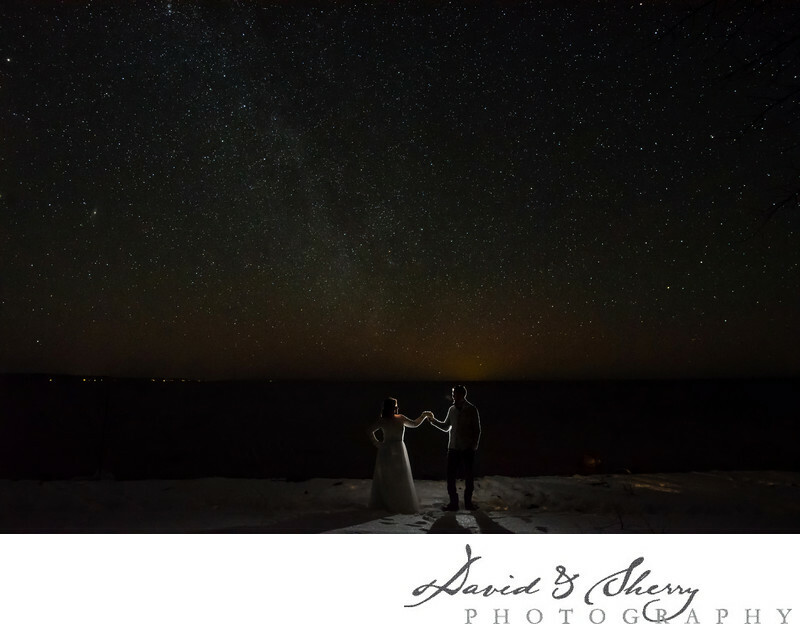 One of the most challenging things we have learned to do in wedding photography is to create stunning stellar nighttime photos featuring the bride and groom and the milky way galaxy. This complex task of freezing the newly married couple with a flash and having a long exposure for the stars is difficult but so rewarding. This photo was taken at Serenity Cottage in Owen Sound and we placed the couple looking at each other so they could be a silhouette against the dark waters while their outline is lit up by a flash held by Sherry. We then leave the shutter open for 4-5 seconds in order to bring in enough light to make out the milky way galaxy. These photos add a beautiful feeling to the end of the wedding album with the last page spread out in stars. I can't think of a more romantic way to end the evening at a out in nature wedding. As it stands, Serenity Cottage is one of the most beautiful small and intimate venues on the water and we love it every time we get to photograph there. We hope to see you there at your wedding.